Handle Material: Black sageo braid over real ray skin. The scabbard of this sword has a black piano high glossy finish. The blade of the sword is made from High 1045 Cardbon steel. This item is a full Tang Sword and can be used in battle action. The Handle has Ray Skin wrapped in Black braided cotton clathe for very durable hand grip durning battle. The item does have 2 knock ouy pins so that the item can be full disasembled & cleaned. Each sword includes a free sword bag. This is a Fully Functional Samurai Katana. It features Full Tang Construction, a Razor Sharp High Carbon Steel Blade, Genuine Ray Skin Handle. This Sword can be Fully Disassembled for cleaning or display. This Hand Honed series swords are full tang and can be fully disassembled. The sword is made with high temper carbon steel, Hangan (Single Hard Steel, Maru Method). Every sword is hand sharpened by our expert blacksmiths. 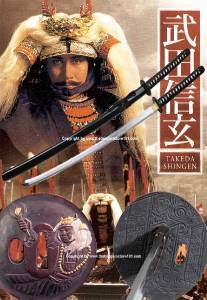 This Samurai Warrior Katana’s handguard features a Japanese Fighting Samurai Warrior on the handgaurd. This is a hand made battle ready katana ready for combat & is made for high 1045 carbon steal. This Katana is a full tang fully functional Katanata that is Battle Ready. This item is also very Sharp from the factory. It also can be sharpen more but this is not a service we offer. The word Samurai means "the one who serves". The samurai led very disciplined lives. They strived always to achieve perfection of the martial arts and their character. Samurai were expected to be capable of bringing the same degree of discipline to the social community as they would to the removal of an enemy's head in battle. This warrior's choice of weapon was the Katana. The katana is a devastatingly quick and powerful weapon. The Samurai viewed the Katana as almost a living thing which they greatly revered. These powerful yet graceful Katanas are made with the old ways in the mountains of China. These are full tang, battle ready, and razor sharp. These Hand Honed series swords are full tang and can be fully disassembled. The sword is made with high temper carbon steel, Hangan(Single Hard Steel, Maru Method). Every sword is hand sharpened by our expert blacksmiths. This Samurai Katana’s tsuba features Japanese men on one side and a warlord with a samurai on the other side. We prefer Pay Pal but will accept all credit card payments. Please note to all credit cards buyer a Pay Pal account is NOT needed to make your credit card payment, but you must checkout through Pay Pal.